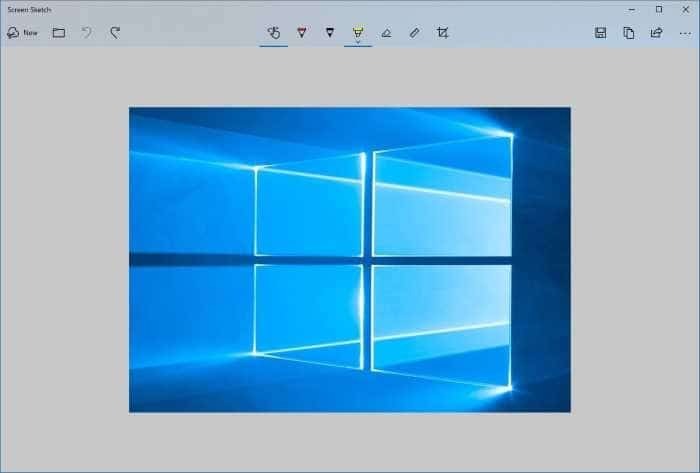 With Windows 10 October 2018 Update (version 1809), Microsoft has introduced a new tool called Snip & Sketch to capture screenshots on Windows 10. The Snip & Sketch tool can not only help you grab screenshots but also annotate them. Microsoft plans to retire the old the Snipping Tool in a feature update. By default settings, Snip & Sketch can be launched either by clicking the Snip & Sketch tile in the Action Center or simultaneously pressing Windows logo + Shift + S keys. PC users who love using keyboard shortcuts might find the default Windows logo + Shift + S keys not very convenient as we need to simultaneously press three keys. Would not it be good if we could launch Snip & Sketch using PrtScn or Print Screen key? As you likely know, with default settings, when you press the Print Screen or PrtScn key on the keyboard, the screen is copied to the clipboard. The copied screen can then be pasted into Paint or any other image processing programs to save it. Since we can grab the screen with Snip & Sketch, it makes sense to use the PrtScn key to open the Snip & Sketch utility. In 1809 and later versions, Windows 10 offers an option to configure the Print Screen or PrtScn to start the new Snip & Sketch tool. By doing so, you can not only launch Snip & Sketch quickly but also give one of your fingers well deserved rest! Tip: You can create a desktop shortcut for Snip & Sketch snip. Complete the given below directions to configure the Print Screen to open Snip & Sketch in Windows 10. Step 1: Open the Settings app. Navigate to Ease of Access > Keyboard. 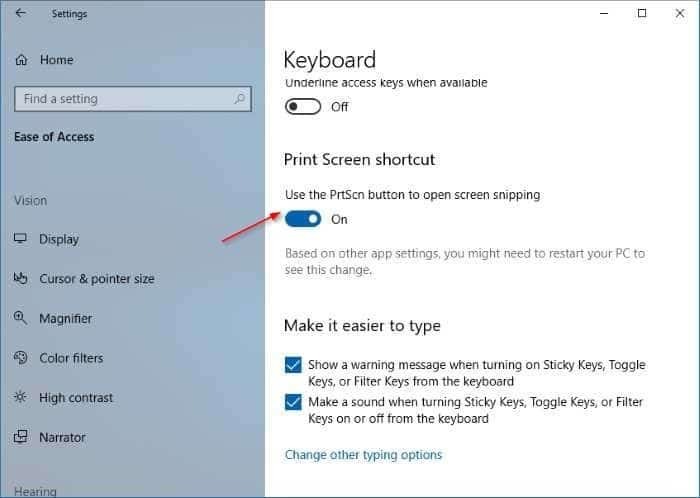 Step 2: Under the Print Screen shortcut section, turn on Use the PrtScn button to open screen snipping option to make Windows 10 open Screen Sketch when you press the PrtScn key. If you cannot find Use PrtScn button to open screen snipping option, you are likely running version 1803 or earlier versions of Windows 10. Tip: If pressing Print Screen key doesn’t open Snip & Sketch, it’s likely because a third-party tool is using Print Screen key. Change the third-party screen capturing tool’s settings to stop it from using Print Screen key. How to remap Windows 10 keyboard guide might also interest you. is it possible to push this setting through GPO?